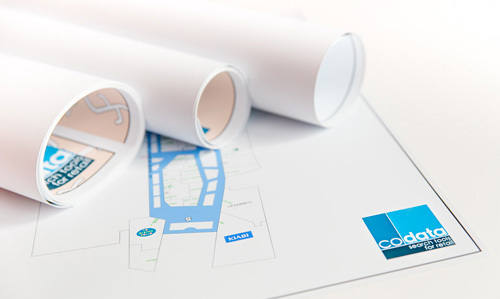 A Codata Key Plan is a detailed map at the cadastral level of a commercial cluster (city centre, retail area or shopping centre). A precise survey of all shops allows the understanding of the general organisation of the cluster. The Key Plan of a commercial cluster also includes the detailed maps of shopping centres, outlet centres, retail parks and sites of type train stations/airports located in the cluster perimeter. Key Plans are on a scale of 1 to 1,000 for city centres and of 1 to 3,000 for retail areas. The size of a Key Plan depends on the size of the represented cluster. Standard formats are A4, A3, A2, A1, A0, 2A0, 3A0 or a multiple of these formats. Each Key Plan is delivered as a tear-proof map with an explanatory index card and with a file in PDF vector format for high definition. Key Plans are always dated. The date corresponds to the last census carried out on the site by Codata teams. Earlier Key Plans are available on special request. Additional information : road network, pedestrian precincts, points of interest, cadastral parcel maps etc. Map key shopping street Site available here and map key Retail Areas here.